Victims of Hurricane Sandy will be getting a very welcome donation, thanks to this fiery feline. The humble Cinder Kitten - only $10 a pop - is a wildly successful charity hit and, as a result, victims of Hurricane Sandy will be getting the benefit from the $2.3 million sales proceeds this World of Warcraft pet raised. 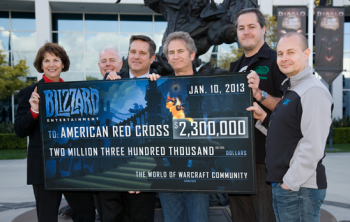 "Thanks again to everyone who helped make a difference," said Blizzard in a blog post. Blizzard refused to take a cut of the Kitten proceeds, promising instead to give 100% of the money raised to the Red Cross' efforts to help Sandy victims. Kitten sales up to December 31st 2012 were included in the charity pot. Just remember, pet owners: replacement fingers can be hard to come by, so always wear gloves when grooming little Cinder!